Organize words to help students organize their knowledge. I invite you to read this E-how Website where you can get ideas for posting activities for students in your blogs. Watch this helpful video by the Cambridge University Press for helping expose vocabulary to students; and watch this video by TEFL videos about teaching with timelines. On Saturday we touched the theme of sight words, also known as function words. 220 of them reside in a list called the Dolch list, and most of these words are taught at beginning levels of English as a foreign language; but students have great difficulty learning them. Why are they so difficult to keep straight? Are they easily memorized? Watch this video by Improve-Education which gives us some ideas of Sight Words and Functions words. Vocabulary is one of the foundations of learning language and it is just as important as grammar when learning a language. We learn and produce vocabulary by using words we learn in context. 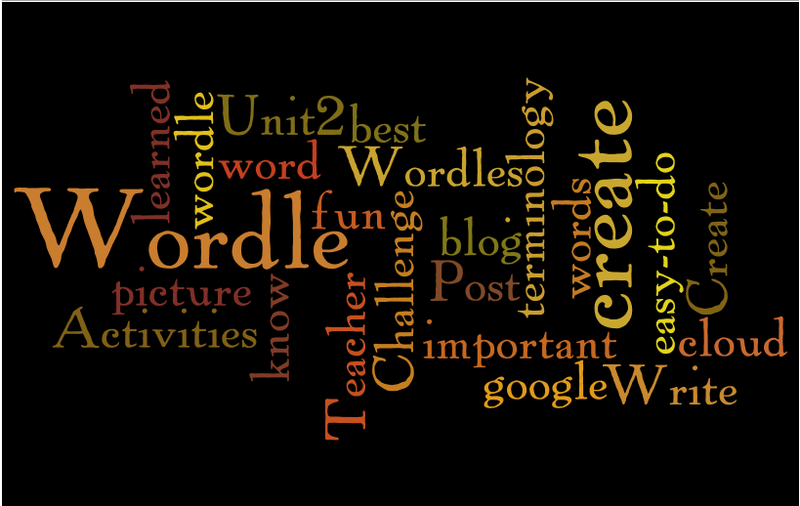 Look at this slideshare presentation, Teaching Vocabulary. Did you learn anything new? The Internet is full of activities that students can practice and play vocabulary on. Look at the slideshare presentation ICT Tools for Teaching Vocabulary. What game, worksheet, interactive Web tool or just plain fun activity did you like from this presentation or any other space? Which You can use any of these ideas or tools to share on your blog. Set up your own game using the words that you must learn from the TKT glossary and create and play with your own game. Write your ideas in a reflection for your blog and link us to the site you recommend. Include: Why do you recommend this tool? How would you use it with your learners? We are all looking forward to sharing great vocabulary learning tips, strategies, and ideas. Please post your ontribution in a timely manner, not at the last minute, so we can all review them before next weekend. Happy searching and experiementing! Ever get caught in the “explanation” game, where the teacher-centered explanation, the worksheets you supply, and the extra practice you give on drill exercises all together don’t seem to help all your students get the grammar point? Sometimes you just have to use material outside the coursebook. Teachers around the world who blog share ideas about waking up your classes. Eva in Turkey’s suggests maintaining and adding information on an excel page that she started: songs to teach grammar. Check it out; it contains more than Beatles songs and you can get many ideas for using songs int he classroom. 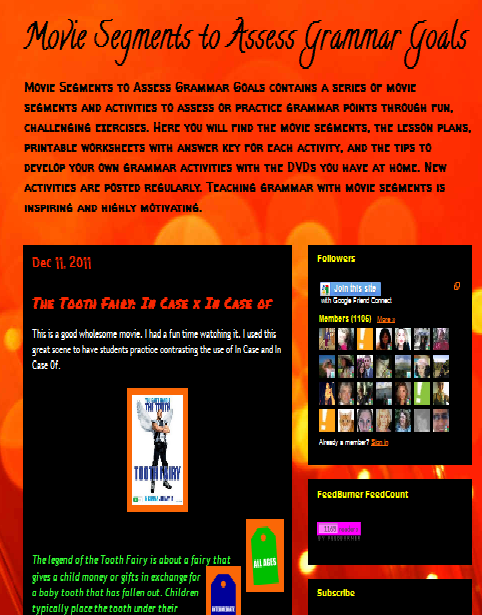 If you like movies and would like to use those in your home collection, Claudio in Brazil has collected a mountain of information and linked movie scenes from present and past films to grammar points with great lesson ideas to help your teaching become student-centered. Try it…it is more interesting than teacher explanations of grammar! Movie Segments to Assess Grammar. From the e-zine Faculty Focus, Edition September 24, 2012, I’d like to share a letter that Dr. Dawn Kaiser, a faculty manager and fulltime online teacher for American Intercontinental University shares with her adult students. When I read it I said, aha! that is exactly like my students and me. Many TKT candidates feel so nervous about returning to study, about using new technologies, or about achieving their educational goals that they do not even know where to begin. Like Dawn, I feel luck to be able to work with adult students who are going back to school or continuing their preparation for a myriad of reasons. Some people need help following writing guidelines, preparing an academic essay, or using online tools, thus affecting their self-esteem or even academic achievement. Dawn began sharing a letter of advice to her students, and the result has been positive, opening dialogue and preparing the way towards hard work and commitment. Like Dawn, I want my students to learn that I care about my them and am here to help them succeed. I would also like to remind them that it is going to take hard work, and that they are the ones who are ultimately responsible for their learning. So, as Dawn’s letter invited to do, I adapted it to meet our TKT needs to let our learning and self-esteem grow. Here it is with changes made to adapt the letter to our situation. You made the choice to work towards a TKT certificate and are taking classes which invite you to work online. Now what? It does not matter when you begin your journey, as any time you begin to reach your educational goals is the perfect time. You are looking at a long road ahead of you, and I will not lie, it will not be easy. Committing to your educational endeavor is like a lifestyle change that will take just that, a commitment, and it is a big one that will take a lot of work. However, believe me, as I am speaking from experience, when I say to you, it will be worth it! Although you have the option of working on paper-based portfolios and products, I know you can beat the steep learning curve and learn online techniques; and I have shared four tips to help you get on a smart track in order to reach the finish line and get certified and prepared for today’s teaching world. 1. Guard Against Self-Destructive Behaviors — You made the first step by applying to to this course and signing up for class. Now, the real work begins. We all have the ability to choose our paths, to reach our goals, and build the life of our dreams. The challenge is in believing in yourself. Next look at how your behavior, emotions, and thoughts are affecting your study habits. Are you procrastinating reading your assigned work, thinking you can just pull whatever information you need from the Internet, not starting your assignments until the last minute, etc.? Examine your self-destructive behaviors. What can you do differently to be more positive and to gain the best experience out of each and every class? 2. Set Attainable Goals — What is your vision of your future? Look at next week, next month, your current class, and each class after right up to the end of your degree. Include goals for all the roles in your life. What is important in attaining those goals you have set? To make a permanent change in how you study, and balance school with the other roles in your life, you will need to set short-term goals — what is due this week? How much time do I need to set aside to complete this assignment? Then look at long-term goals, the class as a whole, and every class you need to take. Once you set your goals, continue to track them so you can see the progress you are making. Tracking your goals will keep you motivated as you check off each task you accomplish. 3. Set up a Support System — You are responsible for your own success, but we all get by with a little help from our friends and family. That is why it is important to build a healthy support system. Share your educational goals and how you are planning to accomplish them. Let others know how important this is to you to have their support. Enlist coworkers, as you never know you may find yourself a study-buddy. Do you have school-age children? Study with them. I actually spent an hour every evening with my son studying. It was a great bonding time between us, and he saw just how important learning was for the both of us. Lean on the people in your network when you feel discouraged or ready to give up due to a difficult subject, and celebrate with them when you reach your goals. 4. Ask Questions — This is your education, and you will get out of it what you put into it. Any time you find yourself struggling to figure out a specific problem, an assignment, or even just not sure what a term means, ASK. I am here to help. If you do not ask, I will not know that you are struggling. I am part of your support system, and I want to see you succeed in the class just as much as you do. Going back to school may not be easy, but with the right mindset, motivation, and support system you can do it. Believe in yourself, and your ability to learn, and you will succeed! Thank you Dr. Dawn Kaiser for putting it so well. You made it! You are about to embark on a journey that will help you be not just a well-prepared teacher to take the TKT exams, but also a great teacher with lots of tricks, tools and toys up his or her sleeve. Welcome to the TKT Preparation Course I am very excited about starting a fresh semester with you. 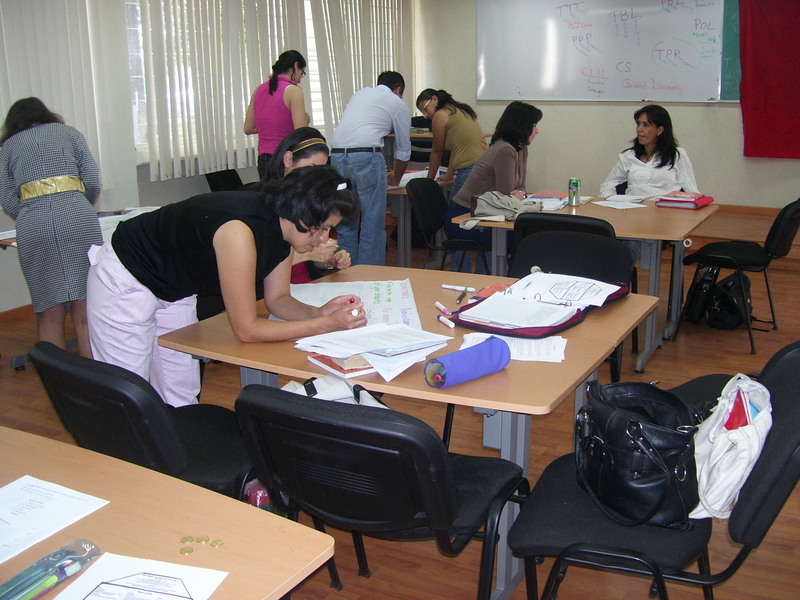 TKT is a course and test about teaching English to speakers of other languages. In this course, you will not only be learning strategies to help you pass the test but you will also discover strategies, techniques and methods to improve your teaching. You might end up shaking your foundations and at the very least, breaking your own traditions to let some new ones in. Subscribe to the blog for any new posts or pages. In order to grow with this course you must participate in the post forums in an active and substantial manner. Please read the page Blogging Guidelines, located in a tab at the top of this page for details on how to post. Substantial= 75 words initial post with minimum amount of grammar and spelling mistakes. 25 words minimum to reply to someone. Posting,”Good job!” will not make it here. As part of the class, you will create your own blog which you will use in this class as your interconnected b-portfolio. Recommended: WordPress.com. WordPress will walk you through the set up process. Set up your blog before class starts; you may use the link on the right of this page entitled Teacher Challenge; this is a step-by-step procedural to help you set up your blog.